Simileoluwa is a Masters student in Development Economics especially passionate about grassroots development policies in Africa. She feels strongly about the protection and empowerment of the most vulnerable groups in society, and has worked over her career to help these groups. With experience in real estate, consulting, and a knack for research and data analysis, Simi is always ready to work on well identified projects. 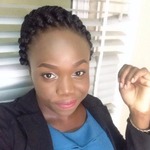 She has a bachelor’s degree in Economics from Babcock University in Nigeria and is currently pursuing a Master’s Degree in International and Development Economics at the University of San Francisco, California.